This cute 3 bed / 2 bath room home is Move -In-Ready. 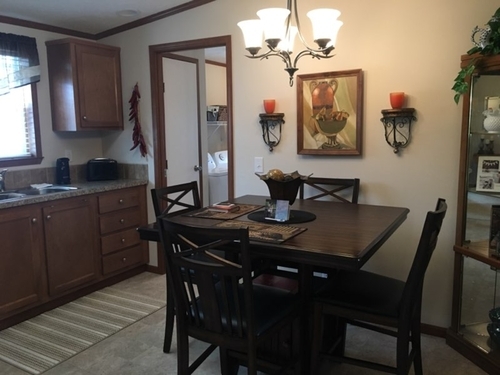 Home is complete with a beautiful eat in kitchen and open spacious floor plan. Master bed room with over-sized closet, and a private master bath with walk-in shower. Call to see this beautiful home today! Woodcreek Village is a 55 + Community, with Elegant one-story homes. We have options for immediate move in or select your own site, and custom home. Centrally located just minutes from shopping, freeways, restaurants and medical facilities. Enjoy events and gatherings at our Clubhouse with Fireside Great Room. 24 Hour Work-out facility, Hot Tub for residents, Club House free to rent for residents.